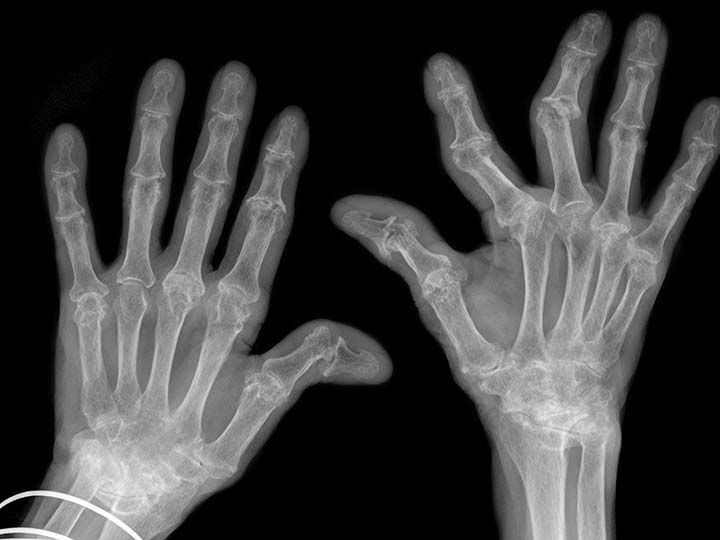 Patients with rheumatoid arthritis (RA) had a 40% to 50% increased mortality risk if they developed breast or prostate cancer, a large, population-based study found. Compared with individuals without RA, those who had previously been diagnosed with RA had an adjusted hazard ratio for mortality of 1.41 (95% CI 1.21 to 1.65, P<0.0001) for breast cancer and 1.53 (95% CI 1.26 to 1.85, P<0.0001) for prostate cancer, according to Maria E. Suarez-Almazor, MD, PhD, of the MD Anderson Cancer Center in Houston, and colleagues. For colorectal cancer, a significantly decreased survival was seen after adjustment for demographics and tumor stage, but not after controlling for comorbidities other than RA (HR 1.15, 95% CI 0.99 to 1.34), and for lung cancer, there was no survival difference among those with and without RA (HR 1.01, 95% CI 0.92 to 1.12), the researchers reported online in Arthritis Care & Research. "These findings suggest that the additional cancer mortality risk from having RA is more pronounced for those tumors with longer expected median survival," they wrote. Patients with RA reportedly have an increased risk for lung cancer and lymphoma, according to a meta-analysis, but appear to have a lower risk for breast cancer, possibly because of hormonal factors, and colorectal cancer, because of the protective effects of nonsteroidal anti-inflammatory drugs. Most earlier studies evaluating the effects of comorbidities on cancer survival have considered overall comorbidities, rather than any individual coexisting condition, including RA. Therefore, to examine the effects of previously diagnosed RA on survival in four common solid tumors, Suarez-Almazor and colleagues analyzed data from the Texas Cancer Registry and the Medicare claims database for patients diagnosed with one of these malignancies between 2001 and 2010. The linked Medicare and Texas registry included 697,734 patients with cancer diagnosed during the study period, with 139,097 having one of the four specified malignancies. A total of 1.1% had two or more RA claims. Patients mean age at the time of cancer diagnosis was 76. Those with RA were more often women, had more comorbidities, resided in areas with lower income, and more often had their cancer diagnosed at regional or distant stages than those without RA (40% versus 34%, P=0.0003). A total of 3.3% of patients with breast cancer had one or more RA claims in the year before diagnosis, as did 1.8% of those with prostate cancer, 2.6% of those with colorectal cancer, and 3.6% of those with lung cancer. Median survival for those without RA versus those with RA was 9.5 versus 7.1 years for breast cancer (P<0.0001), 9.8 versus 7.3 years for prostate cancer (P<0.001), 3.8 versus 2.8 years for colorectal cancer (P=0.0009), and 0.7 versus 0.9 years for lung cancer (P=0.08). For all four types of malignancies, factors that were associated with worse survival were African-American race, lower income, being diagnosed at a later stage, and having more comorbidities. In addition, cardiovascular disease was linked with worse survival for breast, prostate, and colorectal cancer, though not for lung cancer. The researchers noted that the cancers were diagnosed later in RA patients, which may have had an impact on outcomes, but that their data did not include potentially relevant information on treatments. "For instance, patients with RA may be less likely to receive certain therapies such as radiotherapy because of fear of complications or may discontinue therapy early. Likewise, the effect of immunomodulatory agents used in the treatment of RA could also interfere with tumor immunity and possibly result in worse outcomes," they wrote. Of their finding that survival from some malignancies in RA is decreased, they concluded, "Additional research is needed to identify potentially modifiable determinants of this effect." Limitations of the study included its reliance on administrative data, and the inclusion of patients only from the state of Texas.